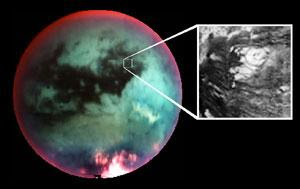 New flyover maps of Titan show the 3-D topography and height of the 1,200-meter (4,000-foot) mountain tops, the north polar lake country, the vast dunes more than 100 meters (300 feet) high that crisscross the moon, and the thick flows that may have oozed from possible ice volcanoes. The topographic maps were made from stereo pairs of radar images. They are available at: http://saturn.jpl.nasa.gov and http://www.nasa.gov/cassini. 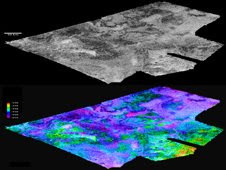 Cassini radar team member Randy Kirk with the Astrogeology Science Center at the U.S. Geological Survey in Flagstaff, Ariz., created the maps. The maps were unveiled at last weeks Lunar & Planetary Science Conference in Houston. 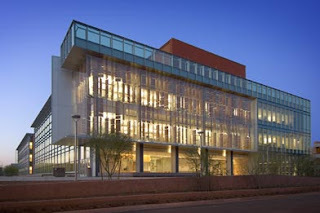 Arizona scientists received $1.273 billion in NSF grants during the period 2000-2008, putting the state in 10th place nationally. The leading state is California, with over $6.7 billion. Phoenix science team co-investigator Carol Stoker of NASA's Ames Lab described 3 factors critical to habitability: "the presence of liquid water; the presence of a biologically available energy source; and the presence of the chemical building blocks of life in a biologically available form." We need to worry as much about running out of water as we do about running out of oil, according to UA law professor Robert Glennon, in his new book, "Unquenchable: American's Water Crisis and What We Can Do About It." The 400-page book delves into issues related to wealth, privatization, farming, water consumption, "water alchemists," water harvesting and other topics. Glennon says conservation must be a major part of the solution, but controlling population growth and using price signals and market forces to allocate water are also critical. One suggestion would be to shift use rights to allow water rights to be transferred from farmers to buyers. That way, farmers could sell land that has the lowest crop yields, reducing their reliance on the water source, Glennon said in a release from UA. 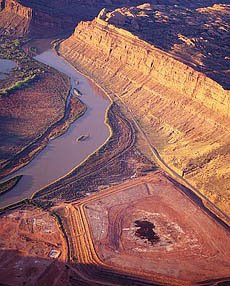 The U.S. Department of Energy has allocated $108 million to remove 16 million tons of uranium tailings on the banks of the Colorado River [right, credit Moabtailings.org] near Moab, Utah, by 2019, according to press reports. The funding will allow removal of 2 million more tons by 2011 and move up completion of the project from 2028. 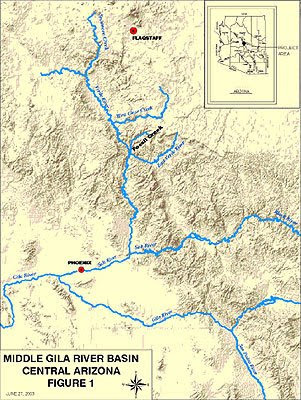 The river is a major water source for Arizona, Nevada, and California. 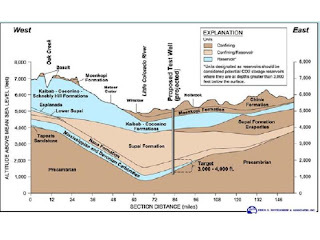 When I was director of the Utah Geological Survey in the 1990's, we critiqued initial plans to cap the tailings in place, for not noting that they lie in the floodplain on the outer bend of the river, making them highly vulnerable to erosion during high water, and carrying the tailings down river. 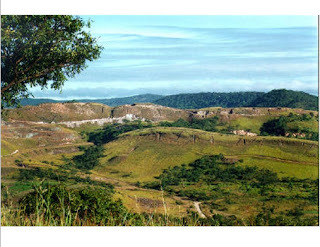 Phoenix-based Freeport McMoRan Copper & Gold has started producing copper cathode at the huge Tenke Fungurume copper-cobalt mine [right, credit Freeport McMoRan], in the Democratic Republic of the Congo, according to a report on Mineweb.com today. 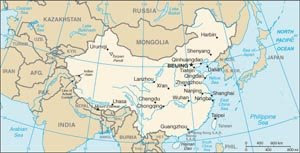 Mineweb says Freeports cash costs of producing the copper are $0.90 per pound, about half the current world spot price. 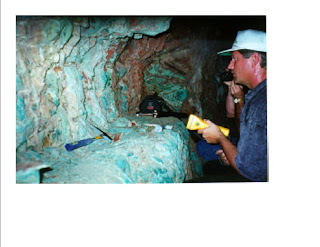 The mine's rich grades of 2.3% copper and 0.3% cobalt help keep costs down. According to the DOE announcement, these oral arguments are part of the adjudicatory proceeding on the Department of Energy’s application submitted to the NRC on June 3, 2008. "Each board consists of three judges, two with legal expertise and one with technical expertise. The three boards will consider and rule upon the admissibility of approximately 320 proposed contentions filed by 14 petitioners. These boards will consider only the standing of the petitioners and the admissibility of the contentions. The merits of any admitted contentions will be considered at a later time." 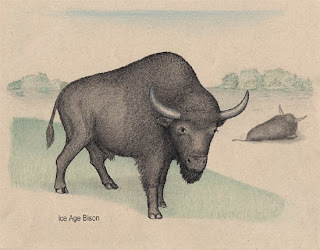 The first traces of anthrax in what is now the U.S. appear to have spread south from Ice Age mammals as the continental ice sheets melted and allowed animals such as bison [right, Ice Age bison. Credit, Ill. State Geological Survey] to migrate from Beringia (Siberia-Alaska) starting as long as 14,000 years ago. 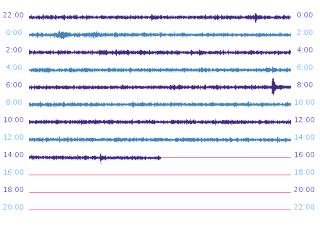 NAU Regent’s professor Paul Keim and NAU professor emeritus Jim Mead, now professor and chair of geosciences at East Tennessee State, used high resolution genomic analysis coupled with extensive strain collections to make their conclusions. 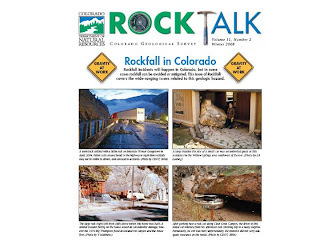 The current issue of the Rock Talk, the Colorado Geological Survey's quarterly newsletter is now online with the entire issue dedicated to rockfalls. The photos and case studies are amazing. There are lessons to be learned on every page. This is yet another powerful education resource on geologic hazards produced by the talented folks at CGS. It can be downloaded at no cost. Private water wells in Arizona are among more than 20% of private domestic wells sampled nationwide that contain at least one contaminant at levels of potential health concern, according to a study by the U.S. Geological Survey (USGS). 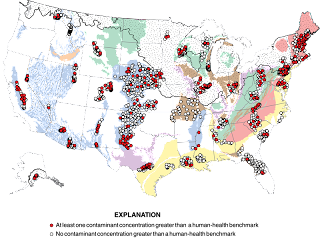 The contaminants most frequently measured at concentrations of potential health concern were inorganic contaminants, including radon and arsenic, which are mostly derived from the natural geologic materials that make up the aquifers from which well water is drawn. Complete findings are available online. Last week's seismic swarm at Bombay Beach along the Salton Sea occurred near the southern tip of the San Andreas fault and a perpendicular fault zone that looks to me like a spreading center or the edge of the Salton trough rift. Denis Norton with Hydrothermals in Stanley, Idaho forwarded this plot he prepared using data from the USGS earthquake catalog. The black dots are the oldest events, light green are the youngest. Size relates to event magnitudes. View is to the WSW with the blue dot being Bombay Beach. 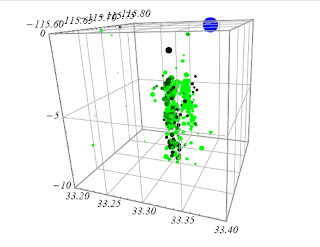 Denis is examining the nature of geothermal reservoirs and mentioned that the quake swarm to the south looks like what they typically see over cooling magmas. Could something similar be occurring at Bombay Beach? The current swarm seems pretty well constrained horizontally, but stretched out vertically. If the swarm is related to igneous activity rather than lateral stress buildup on the San Andreas, that may lower the risk of a large earthquake that would hit Southern California and even trigger significant events on faults closer to Arizona. 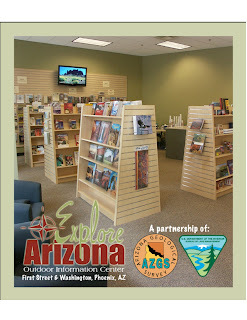 AZGS has cancelled our agreement with the BLM to run the Explore Arizona outdoor information center in downtown Phoenix. Our last day will be April 3, with packing and moving going on the following week. In the meantime, all publications are on sale at 25% off (except for USGS, BLM, and USGF topo maps). 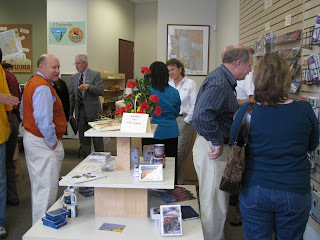 This does include AZGS technical publications and a wide range of popular hiking, natural history, tourism guides. The decision is a result of the budget situation. Explore Arizona was funded with internally-generated monies, not with state tax dollars. But in addition to the substantial cuts in state appropriations to AZGS and other agencies, the Legislature also took our internal funds used to pay the salaries of support and admin staff, and propose to take even larger amounts in the next fiscal year. Even though sales have been steadily increasing since we opened, the projections are that the center would not be fully self-supporting in the next year. As a result, we realized that we would have to scale back our financial commitments in the center and other functions in order to subsidize state-mandated mission-critical functions with the money we raise on our own because the state cannot afford to do so. The sales inventory and fixtures are moving to our store in Tucson, which has been slated for a major overhaul as resources became available. It's our plan to make our Tucson store a one-stop shop for all state and federal publications and materials related to the natural history, resources, and recreation in Arizona. BLM has not announced their plans for the center after AZGS leaves. The UA-run HiRISE camera circling Mars has found a number of brand new craters formed in the past few months, that have turned up water ice that lies only a foot below the Martian surface. On Friday, at the Lunar & Planetary Science Conference in Houston, UA investigator Shawn Byrne reported that the "icy deposits had to be at least a couple of inches (several centimeters) thick, and they couldn't have been unearthed from more than a foot or two down," according to a summary in Sky and Telescope magazine published online. The AZGS is cooperating in a trenching project on the Washington fault, 3 miles south of the Arizona-Utah border. 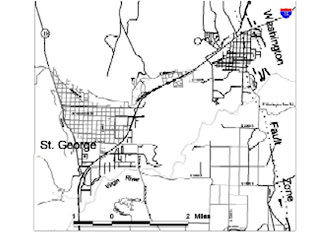 The Utah Geological Survey is funding the project because of the potential seismic risk to Washington City, in Utah [right, credit UGS]. Bill Lund, who heads the UGS Southern Utah office says they have evidence for at least two ruptures in the trench. He hopes to get enough material for accurate age dates of the events. AZGS staff will be on site next week to examine the trench and consider the impacts for Arizona. 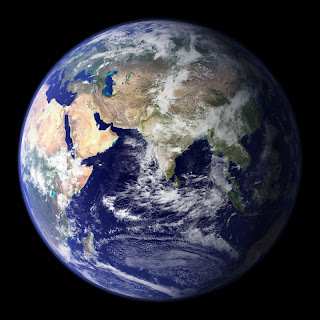 The AMS Policy Statement on Geoengineering the Climate System, says "Geoengineering could conceivably offer targeted and fast-acting options to reduce acute climate impacts and provide strategies of last resort if abrupt, catastrophic, or otherwise unacceptable climate change impacts become unavoidable by other means." 3) moderating specific impacts of global warming (e.g., efforts to limit sea level rise by increasing land storage of water, protecting ice sheets, or artificially enhancing mountain glaciers). The AMS statement is open for comment and will be voted on by its members by this summer. If you're a miner trapped underground by a mining accident, you might use a new technique tested in an abandoned copper mine near Tucson, Arizona, to help rescuers find you. 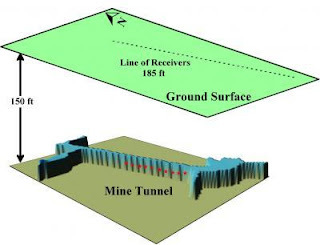 A report in the new issue of SEG's The Leading Edge describes a system of installing simple metal plates in multiple locations along mine walls and keeping sledge hammers adjacent to them. Trapped miners would bang on the plates with the sledges, sending out seismic signals that can be picked up by geophones on the surface. 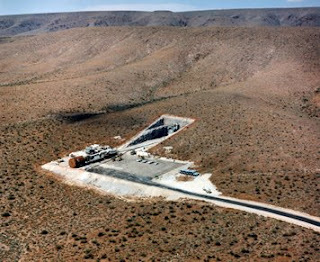 The authors of the study report 100% success in locating test locations accurately underground. The Bombay Beach earthquake swarm continues at California's Salton Sea, at the south end of the San Andreas fault. The California Earthquake Prediction Evaluation Council is reported by local papers as saying on Tuesday that there is a 1-5% chance of a large earthquake (up to M7 or so) in the next few days. There was a M4.0 event overnight. So far, 250+ events have been recorded. The earthquake epicenters appear to outline a diffuse zone at the end of the San Andreas fault and a NE-SW trending transform fault across the southern end of the Salton Sea. California emergency management officials started notifying Arizona counties along the state border today about the potential for a larger event. 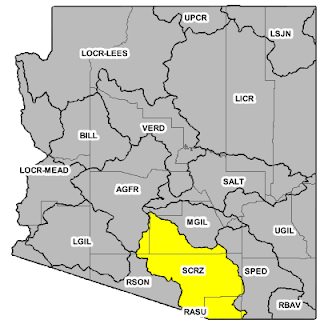 AZGS staff are advising the Arizona Div. of Emergency Management about the potential geologic impacts on Arizona if there is a big quake in California. The EPA's annual Toxic Release Inventory for 2007, shows 297 facilities in Arizona reported a total of 88 million pounds of toxic chemical releases. Arizona’s total reported on-site and off-site releases decreased 9% (8.6 million pounds), when compared to 2006 data. 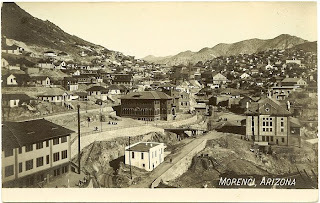 the majority of releases came from mining facilities and electric power plants. The Arizona Silverbelt newspaper reports that "on-site land releases decreased by 8 percent, decreasing more than 7 million pounds." They also note that air releases decreased by 13%, down 591 thousand pounds and water releases increased 638 pounds, up 17% from 2006 data. In addition, the bill reauthorized the National Cooperative Geologic Mapping Act, which funds geologic quadrangle mapping by the AZGS and other state geological surveys. Part of the strategy of the authors of the package was to include 170 separate proposals, to build broad support for the legislation. It appears to have paid off. The carbon dioxide injection will occur on Arizona Public Service Company’s Cholla Power Plant property in Navajo County at a depth of about 3,500 feet. We expect drilling to commence fairly soon. The WESTCARB injection project is sponsored by APS with funding from the Department of Energy. AZGS is a member of WESTCARB. 500 planetary scientists filled a standing-room only presentation yesterday in Houston at the 40th Lunar & Planetary Science conference, to hear the evidence for liquid water on Mars, as reported by the Phoenix Mars Lander team members. 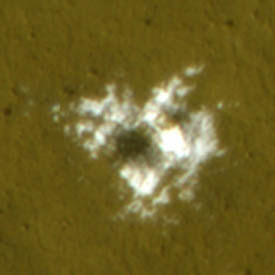 Nilton Renno of the University of Michigan, presented pictures showing apparent drops of liquid on the Lander legs. Other argued that the photos are blown up from edges of larger pictures, so the resolution cannot support the conclusion, and that the chemistry and environmental conditions won't support liquid water. UA scientist Peter Smith is a co-author on one paper calling the spheres water but is also on another paper that disputes that. 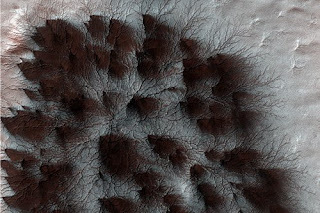 Spring is coming to Mars too, and as the carbon dioxide ice caps melt from above and below, it sublimates directly to gas. The EPA has sent the White House an "endangerment finding" that concludes carbon dioxide is a risk to public health. This sets the stage for possibly regulating CO2 under the Clean Air Act. The biggest impact is expected to be on coal-fired power plants, where CO2 is a waste product that goes up the smokestacks. There is debate over whether CO2 emissions should be taxed or if a cap be placed on the total amounts produced, allowing producers to trade their unused balances. 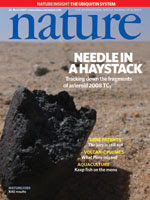 The cover story in this week's Nature is about the meteorites found that can be tied directly to an asteroid impact with Earth, tracked by the team at UA's Mt. Lemmon Observatory. At first the UA team did not expect that any remnants survived as the asteroid was expected to burn up completely in the atmosphere over Sudan. But dozens of students searched the remote site and found 8.7 pounds of the asteroid 2008 TC3. The meteorite is a class F, with iron, nickel, graphites, and nanodiamonds, probably formed by collisions in space. 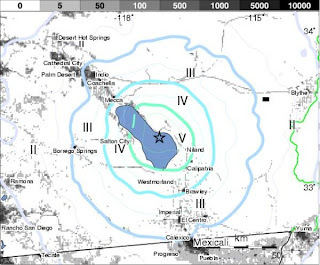 Yesterday's M4.8 earthquake by the Salton Sea in southern California [right, USGS] following a series of smaller events in the previous week, has seismologists wondering if this could be a foreshock for something larger. The series of recent small earthquakes are on the southern tip of the San Andreas fault, suggesting that a larger event would rupture from south to north, with the energy focused into southern California. We expect a north to south rupture would send more energy across Arizona. The article questioned the ability of a school to aim for 100,000 students while growing into a major research center. But they note since Michael Crow became president, ASU "has hired more than 600 tenured or tenure-track faculty members, and last year, for the first time, won a spot on the National Science Foundation’s list of the top 20 research universities without a medical school, along with powerhouses like MIT and the University of California, Berkeley." But, to deal with the state budget cuts, ASU eliminated more than 500 jobs, will close 48 programs, cap enrollment, and make every employee, take 10 to 15 unpaid furlough days this spring. The story is being picked up by news media and bloggers all over the country. 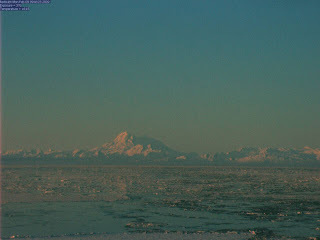 As dawn arrives over Alaska's Cook Inlet, we may see the results of last nights 5 eruption events at Mt. Redoubt, 106 miles southwest of Anchorage. The USGS reports clouds of ash rising to 50,000 feet. A number of geobloggers and websites are following this closely with great detail. I won't attempt to duplicate their work - a good source for updates is the Volcanism Blog. The 800+ page proceedings volume from the Arizona Geological Society's Ores and Orogenesis symposium has been printed and should arrive by the end of the week. To make room for the 1,000 copies of the 5-1/2 pound book, a bunch of us cleaned and re-organized the AGS storage space this afternoon. AGS President Kevin Hortsman, Cori Hoag,Colleen Brown, Bob Kamilli, and Claudia Stone, were heaving around cartoons like longshoreman for a couple of hours. Notice how I managed to avoid capturing anyone's face in the picture on the left? That's Cori on the right, checking an inventory list. Nearly 300 copies were pre-ordered, and the Arizona Geological Survey will have the books for sale in our Tucson bookstore and by mail order. More details when the book arrives. The 40th Lunar & Planetary Science Conference kicks off in Houston tomorrow. 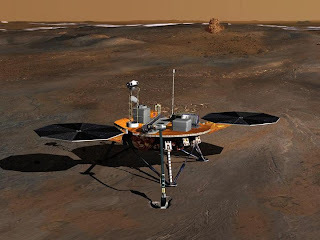 The science news has been full of advance stories about papers that will be presented there over the next five days, with a bunch of them coming from Arizona scientists or using data from Arizona-run missions and instruments - e.g., Phoenix Mars Lander, HiRISE camera, THEMIS. Expect to hear about water and where to look for life on Mars, about methane lakes and dunes on Titan, and more. I attended a number of these conferences in the early 1980s when they were still held at the Lunar and Planetary Institute's original home in a stately mansion on Galveston Bay. I met the legendary John Young, Gemini-Apollo astronaut and first shuttle pilot, when he was judging the infamous annual chili cook-off held on the tree-shaded grounds of the institute. 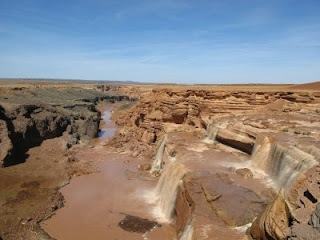 The team of Ryan, Melissa, and Briony, who blog at The Martian Chronicles, have posted extensively on their week-long geology tour of northern Arizona, including excellent photos. The group was looking at terrestrial analogs to Martian geology, but found a lot more. I keep stumbling across more webcams around Arizona. 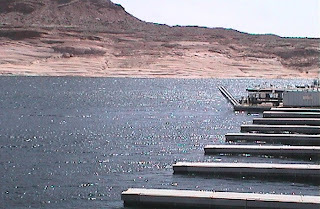 The Glen Canyon National Recreation Area maintains 6 webcams with views mostly from the marinas and launch ramps. The book review in the Arizona Daily Sun covers some of the history and debate over building Glen Canyon Dam, and the obstacles to changing the water and power dynamics of today. In summary: it sounds like there are too many vested interests that want the dam and lake to remain. Researchers from NASA's Johnson Space Center think the UA's HiRISE camera on the Mars Reconnaissance Orbiter has spotted mud volcanoes in the northern plains of that planet [right, University of Arizona/JPL/NASA]. Their paper will be presented at the Lunar and Planetary Science Conference next week. 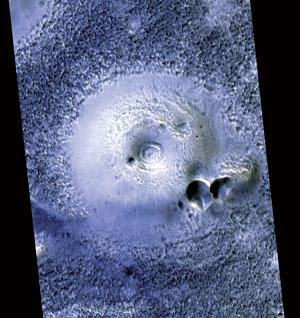 ASU planetary scientist Jack Farmer in an interview in New Scientist said the features could be mud volcanoes but may also be sedimentary remnants from retreating glaciers. However, either way, the presence of fine grained clays in the deposits would be ideal locations to look for organic molecules, "like amonia and proteins." 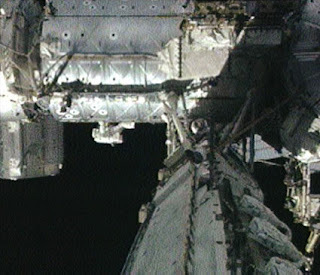 Astronaut Joseph Acaba, who earned his master's degree in geology from UA in 1992, made his first spacewalk today, spending more than six and a half hours outside the space station, with fellow astronaut Steve Swanson. They worked on a truss, installed another GPS antenna, and photographed areas for further work. Update 3-22-09: the news this morning reported that Mr. Acaba, while suspended in space, with no 'up' or 'down,' inserted a pin upside down, jamming some mechanism. Having known some members of the space corps, I expect that his compatriots are going to ride him mercilessly about this, with appropriate denigration of geologists in general. Is uranium in Colorado River naturally occurring? The Environmental Working Group posted a report last month about near-complete scientific studies that show "mine tailings from uranium mining along the Colorado River do not lead to contamination in the main river could undermine environmentalists' and other critics' opposition to Bush administration efforts to permit controversial proposed mines that they fear will contaminate the river." 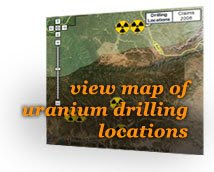 That's a surprising statement from EWG, which in January had released a report under the headline "Grand Canyon Threatened by Approval of Uranium Mining Activities," along with a map [right] showing mining claims marked by radioactive hazard symbols. (http://www.ewg.org/node/27650) says it is under development and not available. EWG's press release said a University of Arizona researcher found that "much of the uranium in the river is naturally-occurring, a key indication that the industrial activity does not harm the water quality for drinking water and agricultural activity that depends on the river for water." A copy of the EWG press release was forwarded to me with a note saying that the study is coming from the Water Sustainability Program at the UA. My source says the UA preliminary findings support the Kaibab Joint Venture Draft Environmental Assessment (http://public.dirxploration.fastmail.us/) conclusion that continued uranium exploration and mining in northern Arizona would not threaten Colorado River quality. If all this information is correct, EWG is also correct in predicting it would have the big impact on actions to stop uranium exploration on federal lands in the region. This is a developing story that is likely to get lots of attention in both the mining and environmental communities. Astronomers from the UA's Catalina Sky Survey will run a workshop April 2-4 to give participants hands-on experience in observing, image processing and data analysis of asteroids and near-Earth objects. But it's not cheap. 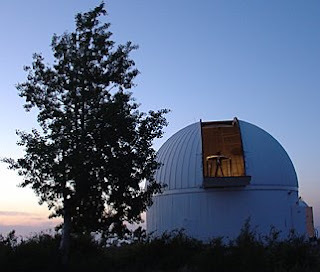 The "Observing Asteroids and Near Earth Objects" workshop costs $725, which includes transportation, food, accommodations, workshop materials, and a tour of Steward Observatory's world-famous Mirror Lab underneath the east wing of the UA football stadium. Participants will need to provide their own laptop computers, which must meet the minimum system requirements listed on the workshop registration page. Registration can be made online at the Mount Lemmon SkyCenter Web site or at the Catalina Sky Survey Web site. Permits and fees to pick up a rock in the national forest? The U.S. Forest Service is considering issuing permits to pick up a rock in the forest around Aspen, Colorado. Really. The Aspen Times reports that the Aspen/Sopris Ranger District is seeking public comments on a program to permit the collection of small amounts of rock for home decorative project with fees to cover the cost of running the program, but permits would also be required to pick up an interesting rock you might see along along the trail. Collecting rocks for commercial purposes would not be covered. AZ DroughtWatch is "a tool designed to collect, summarize and display timely observations of drought impacts across Arizona." In this year's plenary address at the AAAS meeting in Chicago, geologist Susan Kieffer compared slow developing problems like ocean acidification, spreading deserts, dry aquifers, and degraded soils as "stealth disasters" with natural disasters such as floods, and warned that they "will undermine our survival." She called for the creation of a "CDC for Planet Earth" that "could respond to planetary threats with the same coordination that the US Centers for Disease Control and Prevention showed during the SARS and bird flu outbreaks of the late 1990s." The video of her talk is now posted online along with the slides from her presentation. Well, the Washington Post has picked up on something that many of us have been watching for a long time - China is buying up strategic mineral and energy reserves all over the world, and the current depressed global market for commodities has provided them an opportunity to snap up bargains. The Post reports that "The deals have allowed China to lock up supplies of oil, minerals, metals and other strategic natural resources it needs to continue to fuel its growth. The sheer scope of the agreements marks a shift in global finance, roiling energy markets and feeding worries about the future availability and prices of those commodities in other countries that compete for them, including the United States." The Havasupai Tribe announced today that they expect to open Supai Village to tourists and visitors again by May 1, after restoring trails, bridges, and campgrounds from damage that occurred during flooding last August. Brian's daily progress reports and photos show tremendous progress as the Tribe has worked tirelessly since last summer to repair the damage and protect sensitive areas from future damage. Brian and fellow AZGS geologist Ann Youberg spent a week in the canyon last fall, assessing damage and making recommendations that were subsequently adopted by the Tribe. Is there a "peak coal" curve? ASU's THEMIS camera: "Live from Mars"
Has copper price bottomed out? Moving Forest Service to Interior Dept?